The rapper, whose birth name was Ermias Davidson Asghedom, founded the record label All Money In and collaborated with the likes of Kendrick Lamar, Drake and Meek Mill during his career. 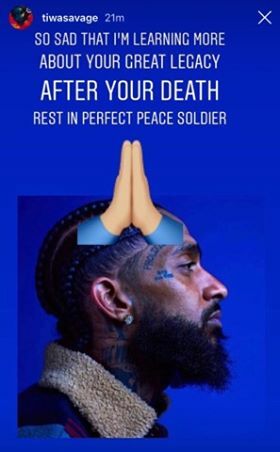 He was scheduled to meet with LA police officials on Monday to discuss ways to stop gang violence. 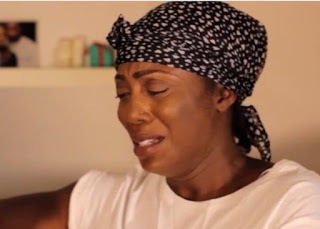 Nigerian musician, Tiwa savage also took to her instagram page to mourn the late rapper saying 'so sad that i'm learning more about your great legacy after your death, rest in perfect peace soldier'. “My spirit is shaken by this,” Rihanna said. “Dear God may His spirit Rest In Peace and May You grant divine comfort to all his loved ones. I’m so sorry this happened to you.” as she also shared her condolences through her instagram page.